Go time travelling to relive our great maritime traditions and heritage. The sea and the life surrounding it still plays an important role here today just as it did in Cook's time. Fishing boats of all sizes are to be seen at almost every town and village along the coast from Whitby to Hartlepool - still reaping a harvest from the sea. To the north, a visit to the remarkable award winning Historic Quay and Museum in Hartlepool's marina area recreates life in a northeast seaport of the 1800's. Here you'll discover the romance and hardships of naval life in the time of the Napoleonic wars. You can browse around authentic quayside shops as you dodge the pressgang, and go into battle with Nelson's navy. Then its aboard HMS Trincomalee to taste at first hand what life in the navy was really like! Launched in India in 1817, the ship is a Napoleonic triple-masted frigate and Europe's oldest battleship. She has been carefully restored to her original state and along with the restored paddle steamer PSS Wingfield Castle forms a floating flotilla of maritime heritage. At Stockton's Castlegate Quay, you can see a splendid floating replica of one of Cook's famous ships the 'Endeavour'. This is the centrepiece of a riverside complex which includes a watersports centre and river cruising on the Tees. Cook's birthplace at Marton in Middlesbrough is the location of a major museum devoted to his life and achievements. 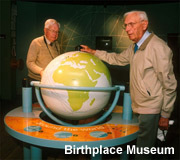 Set in a magnificent parkland, the museum is packed full of interactive exhibits and relics of Cook's voyages. Redcar is home to the 'Zetland', the oldest remaining lifeboat in the world today. Over 200 years old, the boat has saved over 500 lives and now forms the centrepiece of a fascinating museum of local maritime and social history. Smuggling was big business all along this coast during Cook's time. Robin Hood's Bay, Runswick Bay Sandsend and Staithes all profited from 'free-trading' and dark tales of this secretive activity can be heard at the Saltburn Smugglers Heritage Centre where the sights, sounds and smells of the contraband trade are brought to life in the original fishermen's cottages. 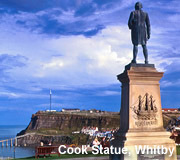 Whitby, has a long tradition of seafaring dating back hundreds of years. This is where James Cook first went to sea and learned navigation. His association with the town and his later feats of discovery are relived in the original house in which he lived, now the Captain Cook Memorial Museum in Grape Lane. Whitby Museum has a unique collection of fossils and tells the story of the town's once flourishing whaling trade and the exploits of the Scoresby's, inventors of the 'crow's-nest'.